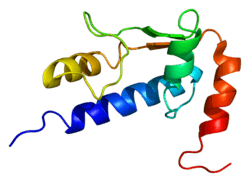 General transcription factor II-I is a protein that in humans is encoded by the GTF2I gene. This gene encodes a multifunctional phosphoprotein with roles in transcription and signal transduction. It is deleted in Williams-Beuren syndrome, a multisystem developmental disorder caused by the deletion of contiguous genes at chromosome 7q11.23. The exon(s) encoding 5' UTR has not been fully defined, but this gene is known to contain at least 34 exons, and its alternative splicing generates 4 transcript variants. 1 2 Grueneberg DA, Henry RW, Brauer A, Novina CD, Cheriyath V, Roy AL, Gilman M (Oct 1997). "A multifunctional DNA-binding protein that promotes the formation of serum response factor/homeodomain complexes: identity to TFII-I". Genes & Development. 11 (19): 2482–93. doi:10.1101/gad.11.19.2482. PMC 316568 . PMID 9334314. 1 2 Yang W, Desiderio S (Jan 1997). "BAP-135, a target for Bruton's tyrosine kinase in response to B cell receptor engagement". Proceedings of the National Academy of Sciences of the United States of America. 94 (2): 604–9. doi:10.1073/pnas.94.2.604. PMC 19560 . PMID 9012831. 1 2 "Entrez Gene: GTF2I general transcription factor II, i". ↑ Sacristán C, Tussié-Luna MI, Logan SM, Roy AL (Feb 2004). "Mechanism of Bruton's tyrosine kinase-mediated recruitment and regulation of TFII-I". The Journal of Biological Chemistry. 279 (8): 7147–58. doi:10.1074/jbc.M303724200. PMID 14623887. ↑ Novina CD, Kumar S, Bajpai U, Cheriyath V, Zhang K, Pillai S, Wortis HH, Roy AL (Jul 1999). "Regulation of nuclear localization and transcriptional activity of TFII-I by Bruton's tyrosine kinase". Molecular and Cellular Biology. 19 (7): 5014–24. doi:10.1128/mcb.19.7.5014. PMC 84330 . PMID 10373551. 1 2 Wen YD, Cress WD, Roy AL, Seto E (Jan 2003). "Histone deacetylase 3 binds to and regulates the multifunctional transcription factor TFII-I". The Journal of Biological Chemistry. 278 (3): 1841–7. doi:10.1074/jbc.M206528200. PMID 12393887. ↑ Tussié-Luna MI, Bayarsaihan D, Seto E, Ruddle FH, Roy AL (Oct 2002). "Physical and functional interactions of histone deacetylase 3 with TFII-I family proteins and PIASxbeta". Proceedings of the National Academy of Sciences of the United States of America. 99 (20): 12807–12. doi:10.1073/pnas.192464499. PMC 130541 . PMID 12239342. ↑ Hakimi MA, Dong Y, Lane WS, Speicher DW, Shiekhattar R (Feb 2003). "A candidate X-linked mental retardation gene is a component of a new family of histone deacetylase-containing complexes". The Journal of Biological Chemistry. 278 (9): 7234–9. doi:10.1074/jbc.M208992200. PMID 12493763. ↑ Kim DW, Cochran BH (Feb 2000). "Extracellular signal-regulated kinase binds to TFII-I and regulates its activation of the c-fos promoter". Molecular and Cellular Biology. 20 (4): 1140–8. doi:10.1128/mcb.20.4.1140-1148.2000. PMC 85232 . PMID 10648599. ↑ Roy AL, Carruthers C, Gutjahr T, Roeder RG (Sep 1993). "Direct role for Myc in transcription initiation mediated by interactions with TFII-I". Nature. 365 (6444): 359–61. doi:10.1038/365359a0. PMID 8377829. ↑ Casteel DE, Zhuang S, Gudi T, Tang J, Vuica M, Desiderio S, Pilz RB (Aug 2002). "cGMP-dependent protein kinase I beta physically and functionally interacts with the transcriptional regulator TFII-I". The Journal of Biological Chemistry. 277 (35): 32003–14. doi:10.1074/jbc.M112332200. PMID 12082086. ↑ Kim DW, Cheriyath V, Roy AL, Cochran BH (Jun 1998). "TFII-I enhances activation of the c-fos promoter through interactions with upstream elements". Molecular and Cellular Biology. 18 (6): 3310–20. doi:10.1128/mcb.18.6.3310. PMC 108912 . PMID 9584171. ↑ Roy AL, Du H, Gregor PD, Novina CD, Martinez E, Roeder RG (Dec 1997). "Cloning of an inr- and E-box-binding protein, TFII-I, that interacts physically and functionally with USF1". The EMBO Journal. 16 (23): 7091–104. doi:10.1093/emboj/16.23.7091. PMC 1170311 . PMID 9384587. ↑ Roy AL, Meisterernst M, Pognonec P, Roeder RG (Nov 1991). "Cooperative interaction of an initiator-binding transcription initiation factor and the helix-loop-helix activator USF". Nature. 354 (6350): 245–8. doi:10.1038/354245a0. PMID 1961251. Roy AL, Meisterernst M, Pognonec P, Roeder RG (Nov 1991). "Cooperative interaction of an initiator-binding transcription initiation factor and the helix-loop-helix activator USF". Nature. 354 (6350): 245–8. doi:10.1038/354245a0. PMID 1961251. Roy AL, Carruthers C, Gutjahr T, Roeder RG (Sep 1993). "Direct role for Myc in transcription initiation mediated by interactions with TFII-I". Nature. 365 (6444): 359–61. doi:10.1038/365359a0. PMID 8377829. Roy AL, Du H, Gregor PD, Novina CD, Martinez E, Roeder RG (Dec 1997). "Cloning of an inr- and E-box-binding protein, TFII-I, that interacts physically and functionally with USF1". The EMBO Journal. 16 (23): 7091–104. doi:10.1093/emboj/16.23.7091. PMC 1170311 . PMID 9384587. Pérez Jurado LA, Wang YK, Peoples R, Coloma A, Cruces J, Francke U (Mar 1998). "A duplicated gene in the breakpoint regions of the 7q11.23 Williams-Beuren syndrome deletion encodes the initiator binding protein TFII-I and BAP-135, a phosphorylation target of BTK". Human Molecular Genetics. 7 (3): 325–34. doi:10.1093/hmg/7.3.325. PMID 9466987. Kim DW, Cheriyath V, Roy AL, Cochran BH (Jun 1998). "TFII-I enhances activation of the c-fos promoter through interactions with upstream elements". Molecular and Cellular Biology. 18 (6): 3310–20. doi:10.1128/mcb.18.6.3310. PMC 108912 . PMID 9584171. Cheriyath V, Novina CD, Roy AL (Aug 1998). "TFII-I regulates Vbeta promoter activity through an initiator element". Molecular and Cellular Biology. 18 (8): 4444–54. doi:10.1128/mcb.18.8.4444. PMC 109030 . PMID 9671454. Novina CD, Cheriyath V, Roy AL (Dec 1998). "Regulation of TFII-I activity by phosphorylation". The Journal of Biological Chemistry. 273 (50): 33443–8. doi:10.1074/jbc.273.50.33443. PMID 9837922. Novina CD, Kumar S, Bajpai U, Cheriyath V, Zhang K, Pillai S, Wortis HH, Roy AL (Jul 1999). "Regulation of nuclear localization and transcriptional activity of TFII-I by Bruton's tyrosine kinase". Molecular and Cellular Biology. 19 (7): 5014–24. doi:10.1128/mcb.19.7.5014. PMC 84330 . PMID 10373551. Kim DW, Cochran BH (Feb 2000). "Extracellular signal-regulated kinase binds to TFII-I and regulates its activation of the c-fos promoter". Molecular and Cellular Biology. 20 (4): 1140–8. doi:10.1128/MCB.20.4.1140-1148.2000. PMC 85232 . PMID 10648599. Cheriyath V, Roy AL (Aug 2000). "Alternatively spliced isoforms of TFII-I. Complex formation, nuclear translocation, and differential gene regulation". The Journal of Biological Chemistry. 275 (34): 26300–8. doi:10.1074/jbc.M002980200. PMID 10854432. Parker R, Phan T, Baumeister P, Roy B, Cheriyath V, Roy AL, Lee AS (May 2001). "Identification of TFII-I as the endoplasmic reticulum stress response element binding factor ERSF: its autoregulation by stress and interaction with ATF6". Molecular and Cellular Biology. 21 (9): 3220–33. doi:10.1128/MCB.21.9.3220-3233.2001. PMC 86961 . PMID 11287625. Kim DW, Cochran BH (May 2001). "JAK2 activates TFII-I and regulates its interaction with extracellular signal-regulated kinase". Molecular and Cellular Biology. 21 (10): 3387–97. doi:10.1128/MCB.21.10.3387-3397.2000. PMC 100260 . PMID 11313464. Egloff AM, Desiderio S (Jul 2001). "Identification of phosphorylation sites for Bruton's tyrosine kinase within the transcriptional regulator BAP/TFII-I". The Journal of Biological Chemistry. 276 (30): 27806–15. doi:10.1074/jbc.M103692200. PMID 11373296. Cheriyath V, Desgranges ZP, Roy AL (Jun 2002). "c-Src-dependent transcriptional activation of TFII-I". The Journal of Biological Chemistry. 277 (25): 22798–805. doi:10.1074/jbc.M202956200. PMID 11934902. Casteel DE, Zhuang S, Gudi T, Tang J, Vuica M, Desiderio S, Pilz RB (Aug 2002). "cGMP-dependent protein kinase I beta physically and functionally interacts with the transcriptional regulator TFII-I". The Journal of Biological Chemistry. 277 (35): 32003–14. doi:10.1074/jbc.M112332200. PMID 12082086. Tussie-Luna MI, Michel B, Hakre S, Roy AL (Nov 2002). "The SUMO ubiquitin-protein isopeptide ligase family member Miz1/PIASxbeta /Siz2 is a transcriptional cofactor for TFII-I". The Journal of Biological Chemistry. 277 (45): 43185–93. doi:10.1074/jbc.M207635200. PMID 12193603. Tussié-Luna MI, Bayarsaihan D, Seto E, Ruddle FH, Roy AL (Oct 2002). "Physical and functional interactions of histone deacetylase 3 with TFII-I family proteins and PIASxbeta". Proceedings of the National Academy of Sciences of the United States of America. 99 (20): 12807–12. doi:10.1073/pnas.192464499. PMC 130541 . PMID 12239342. Wen YD, Cress WD, Roy AL, Seto E (Jan 2003). "Histone deacetylase 3 binds to and regulates the multifunctional transcription factor TFII-I". The Journal of Biological Chemistry. 278 (3): 1841–7. doi:10.1074/jbc.M206528200. PMID 12393887.